An artist's depiction of NASA's New Horizons spacecraft flying by Pluto. A fleet of NASA probes across the solar system will track the encounter on July 14, 2015. While New Horizons will be all by its lonesome as it speeds past Pluto July 14, a fleet of spacecraft closer to home will also be watching the dwarf planet. Between Earth and Saturn, NASA machines will turn their eyes to the outer solar system..
"The Cassini team has been pleased to provide occasional imaging support for New Horizons for several years to aid with the Pluto-bound spacecraft's navigation. It's great to provide one last look at it soars through the Pluto system," Earl Maize, Cassini project manager at NASA's Jet Propulsion Laboratory in California, said in a statement. Two observatories closer to Earth will also gaze outward. On July 23, the Spitzer Space Telescope (which trails behind our planet) will start seven days of observations. Its infrared images are supposed to gather data on ice that could be changing on Pluto's surface. Then in October, the planet-hunting Kepler spacecraft – which is also in an Earth-trailing orbit – will take an unprecedented three-month break from its usual work. Instead of looking for exoplanets, it will examine how much light is reflected off of Pluto and Charon, Pluto's largest moon. This is supposed to reveal more information about Pluto's atmosphere and surface, which could change drastically as the dwarf planet goes along its eccentric orbit. Also joining the action a few weeks ago was SOFIA (Stratospheric Observatory for Infrared Astronomy), an infrared telescope that flies high in Earth's atmosphere on a 747 aircraft. On June 28, the airplane flew in a path that put a star right behind Pluto (from Earth's perspective). The resulting shadow from Pluto was then analyzed to gather more information about how dense Pluto's atmosphere is, and how it is structured. The Hubble Space Telescope (in low-Earth orbit) is also continuing its observations of the dwarf planet. Previously, the telescope assisted in the discovery of four Pluto moons (Nix, Hydra, Kerberos and Styx) before and after New Horizons' launch in 2006. 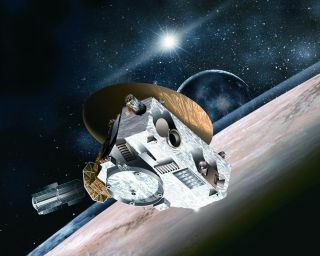 Editor's Note: Visit Space.com daily through July 14 for daily updates on the Pluto Flyby by New Horizons.